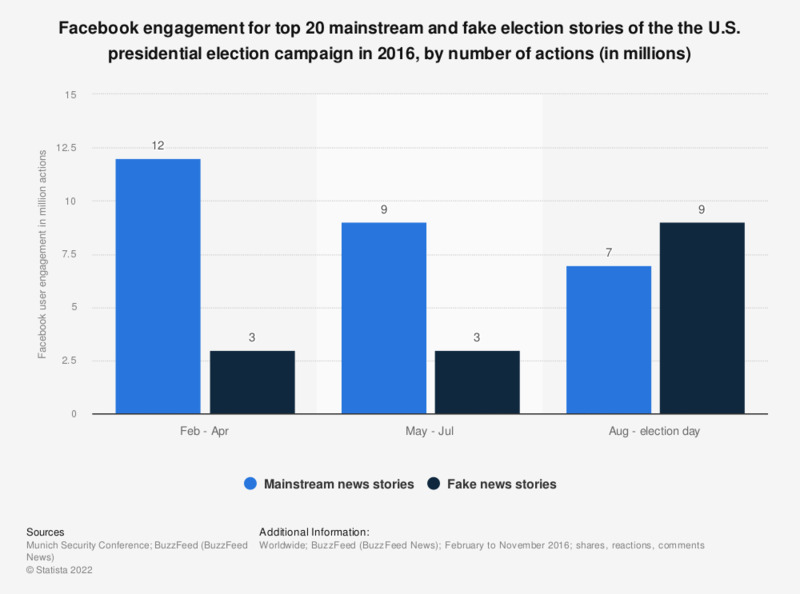 This statistic displays the Facebook engagement for the top 20 mainstream and fake election stories of the the U.S. presidential election campaign 2016, sorted by number of actions. From February to April 2016, mainstream news stories generated 12 million actions on the social platform, compared to 3 million actions through fake news. From August to Election Day, fake news generated 9 million Facebook actions. Everything On "Social media and politics in the United States" in One Document: Edited and Divided into Handy Chapters. Including Detailed References. Statistics on "Social media and politics in the United States"
Digital native news sources used during 2016 presidential election in U.S.
Do most of your Facebook friends have similar political beliefs to you? On which of the following topics have you seen trolling behavior on the internet? Do you think the way Donald Trump uses Twitter is appropriate or inappropriate for the President of the United States? Are social media sites like Facebook and YouTube currently doing enough or not doing enough to stop the spread of fake news on their sites? How much are social media sites like Facebook and YouTube responsible for the spread of fake news? How likely do you think it is that Russian-backed content on social media affected the outcome of the 2016 presidential election? How many of Hillary Clinton's supporters do you think are racist? Which of the following areas do you think the result of the 2016 US election will impact most?